Since I already picked Captain Marvel earlier in this blog series, there’s really no choice but to book-end things with Jim Starlin’s other cosmic hero — Warlock. I suppose that Thanos is really Starlin’s most important cosmic character. Warlock and Captain Marvel share Thanos as a nemesis, and Thanos has far eclipsed them both in the popular imagination, and getting built up as the Big Bad of Marvel’s movie franchise. I have my hopes that Warlock will soon pop from that cocoon we saw at the end of the last Guardians movie, but whoever shows up on screen will likely have little to do with the fabulous space hippie that Jim Starlin made his own in this brief 1970s series, picking up where his Captain Marvel run left off, and replacing much of Cap’s action with romance and Hamlet-like dramatics. 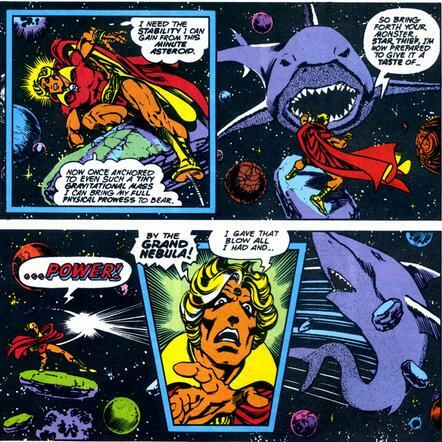 If Captain Marvel was a superhero book set in space, Warlock was a full-on space opera, and if the series bottomed out with space sharks, it also gave us a great and boundry-pushing run as Warlock took on his own future self in the form of a power-mad cosmic messiah. Pip the Troll was awesome, too. There are doubtless better “W” books out there, but Warlock is my favorite. How about you? Posted on February 24, 2018, in Comics A-To-Z and tagged Warlock. Bookmark the permalink. 4 Comments. Quite a few “W” choices, actually. In addition to what Paul has listed, there’s Wolverine (shocked that one’s not in his list), Web of Spider-Man, West Coast Avengers, Weird war Tales, and What If? I did like the Wolverine miniseries but wasn’t terribly impressed with his ongoing, though I only got the first few issues. I guess I’ve got to go with Warlock, a series I never collected back in the day but read thanks to Marvel Unlimited a few years ago. Wolverine got kind of lost in my anti-X-Men bias (which is second only to Spider-Man when it comes to my Marvel blind spots). As you will see (have seen?) tomorrow, I’m pretty much asking for an intervention when it comes to the X-Men at this point. Just stopping by to tell you how much I’m loving these “A to Z” posts! I agree with the majority of your choices. As much as I love Mike Grell’s Warlord (and what a long and glorious run that magnificent mag had) I totally agree with your pick here, too. Warlock is my favorite comicbook ever. Always a special day when the Groovy Agent drops by … Diversions of the Groovy Kind remains the best in breed for Bronze Age comics blogs, delighted to have you here! (And especially groovy to know that we both hold Adam Warlock in such high esteem).